NEW YORK CITY — From Russian bath houses in Brooklyn, to South American bakeries in Queens and West African restaurants in the Bronx, there's a New York City venue that's rooting for each one of the 32 teams participating in this year's World Cup. Find your team in this A-Z guide and join fellow supporters to watch the games and enjoy special deals on food and drinks. The local Algerian community flocks to this Italian restaurant on Steinway Street every time their team takes the field. It doesn't matter if you speak Arabic, French, Italian or English — you'll enjoy watching a game here. This bistro on West Broadway and Grand Street installs two projectors and opens up its second floor during the World Cup. They'll be hosting a Father's Day/World Cup viewing party this Sunday. Come early, as staff say Argentine fans have been known to show up two hours before kickoff. This Australian-run restaurant on Franklin Street is great for laid back soccer fans. The team isn't expected to go far, so Northern Territory is going to make the most of it while it lasts. They'll serve $3 Foster pints and will be handing out promotional giveaways from Australia. This European eatery on 51st Street has a loyal customer base of Belgian and French ex-pats so don't be surprised if you hear cheering in another language. The proud owner of this humble cafe on 34th Avenue bought a TV specifically for the World Cup. "Everything will be blue and yellow, like the flag," said proprietor Ifeta Huskovic. "It will be a party." They don't serve alcohol but they have plenty of food, patriotism and a popular South-Eastern European orange drink called Jupi. Listen to live samba every time Brazil plays at this South 5th Street restaurant. This place also has a TV outside in the patio. They'll be hosting a World Cup kickoff party on Thursday. The Cameroon community in the city may be small, but if you want to root for their team you should check out this sports bar on Fredrick Douglas Boulevard. It's a great place to watch a game and many of Harlem's West African residents hang out here, according to staff at the bar. Go to the Astoria Boulevard bakery for the atmosphere and stay to enjoy their completos: Chilean-style hot dogs served with diced tomatoes, mayo and avocado on a toasted bun. Ruben Caveno opened this restaurant to bring authentic Colombian food to Queens. He'll be serving chicharones and fried plantains for soccer fans at this family-friendly eatery on Queens Boulevard. Yes, this place is Cuban, not Costa Rican. But that doesn't keep the Costa Rica Networking Group of New York City — a small but loyal group of fans — from meeting at the venue on LaGuardia Place for every Costa Rica game. Hang out with Eastern Europeans at this Croatian restaurant/social club on Astoria Boulevard. They've been around since 1959 and love their tradition as much as their soccer team. Avoid the hooligans and watch games at this family-friendly Ecuadorian restaurant on Roosevelt Avenue. Their clients "are always large groups and families meeting up to watch the games. Everyone is wearing a jersey," one of the servers said. “It’s going to be mental,” said manager Josephine Vasquez. The English owner hosts British soccer games every weekend, so they have a loyal following of "proper football fans." It's just like watching a game in England, although Americans tend to eat a little more at this 5th Avenue pub, Vasquez said. The venue will be having Champagne Thursdays throughout the games, and no matter who wins, after the final whistle of the games at the restaurant, an in-house DJ will launch a World Cup celebration at Opia. This Avenue C beer garden is going to transform into World Cup central. They’ll be showing every game live and will replay the games at night. For the first time ever, the German restaurant is going to be serving Brazilian food to honor the World Cup host. 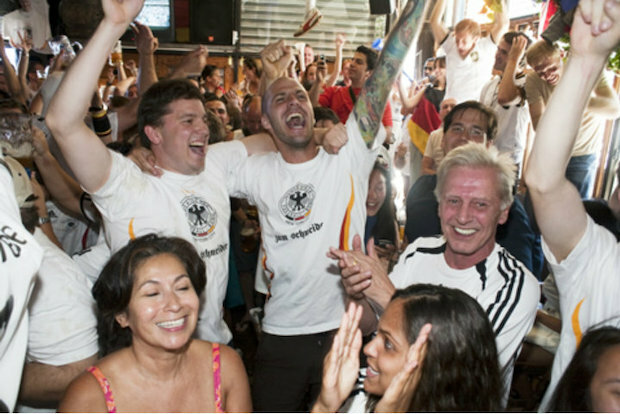 For big games, like Germany vs. USA, they will close the restaurant and move to along the East River where they’ll have open-air screenings on a massive 11-by-18-foot LED screen and live bands. You won't find too many people cheering on the U.S. at this McClellan Street restaurant when they face Ghana on Monday. Located in the heart of little Ghana in The Bronx, Papaye attracts fans from all over New York. There are plenty of Greek restaurants along 30th Avenue in Astoria, but many local Greeks flock to Cafe Athens and they’ll be there to watch their team during the World Cup. The cafe has five TVs and will be serving appetizer specials that include cheese pies and spinach pies. They’ll also be serving Greek beers for $5 during every game. This Karaoke bar is not particularly Dutch, but during the last two World Cups 2006 and 2010 there was a loyal group of fans from Holland. They'll show every game and have happy hour specials throughout the tournament. This place is named after the soccer team's nickname, a slang term to describe Honduran people. Use the World Cup as an excuse to try their bean and cheese-filled hand-made tortillas. This Iranian cafe on 8th Street will have a pep rally brunch with live entertainment from a Persian country music band before their team takes on Argentina on June 21. They have seven beers on tap and will be selling Standard Pale Ale for $4.50 every time Iran plays. This quaint Neapolitan pizza place on 12th Street may not seem like an ideal place to watch a soccer game, but they pull down a 16-foot projector screen to host viewing parties every week. Pizza and beer specials will be on offer. From a block away, people can hear fans screaming from this intimate eatery on 119th whenever their team scores. "There is a special ambiance here," said Cheick Cisse, the owner from the Ivory Coast. Western Africans living in Harlem come to this bar to cheer for their team. This is the perfect place for sushi lovers disguised as soccer fans. Get an all-you-can-eat special for $27.95 and add $5 to make it an all-you-can-drink special. Games last 90 minutes, so you'll have plenty of time to get your money's worth at this First Avenue sushi bar. You can win a free pitcher of booze after every game. "People can guess the final score and whoever wins gets a pitcher," manager Salomon Ramos said. The spot on 47th Avenue fills up with green jerseys every time Mexico plays, so come early. The owner of this Fulton Street restaurant is giving away free Champagne every time Nigeria scores. "I don't care, I hope they score a lot of goals," Lookman Mashood said. Although they only serve Nigerian food, they will be supporting all African teams. "This is the Portuguese stadium in Manhattan," said one of the bartenders. Portuguese fans come from all over New York and New Jersey to Spring Street with their faces painted red and green. They don’t take reservations, so come early if you want to get a seat for the game. Get in a sauna before watching the game. You could even swim in the pool while watching the game. This Russian bath house on Sheepshead Bay Road has TVs everywhere. They also have a generous drink special of a 1.8 liters of Becks for $7.50. Among 32nd Street's karaoke bars is a sports bar with happy hours that include buy-one-get-one-free shots and 25 cent wings if you buy a pitcher of beer. The bar is on the second floor so it can be a little tricky to find. “So many people came to watch that the two restaurants next door put up Spain flags,” a server recalled of the 14th Street tapas and paella restaurant during the 2010 World Cup. The second floor is usually reserved for flamenco dancing but they transform it into a small theater with seats and a big projector. They have Swiss beer, Swiss wine and even Swiss Bloody Marys. The back wall of this brunch destination on Lafayette Street will be transformed into a giant screen during the tournament. You can't get more American than all-you-can-eat barbecue for $13. This 5th Avenue bar is headquarters to the local chapter of the American Outlaws, a U.S. soccer support group. Watching a game here will feel like a 4th of July party. Like Argentina, Uruguay is known for their steak. The World Cup is the perfect excuse to come to this steakhouse on 37th Avenue. It's a quiet, family-friendly restaurant during the week that turns into South American soccer central in the weekends.